Writing on their indiegogo campaign page, the group describes how they are living, working, and rehabilitating a 2.5 acre of land that was neglected for 15 years. Not only was it neglected, but located at Thahr al Okda, on the outskirts of Ramallah, it is said to be marshaled by Israeli forces. Still, Mashjar Juthour, which translates as the place of trees and botanical and cultural roots, reports having been unencumbered by any of the country’s forces. “At Mashjar Juthour, we have been thus far unbothered,” writes the group, “and we are hellbent on making something with this exceptional situation.” With their open and warm tone, one gets the sense that this team is fun, but also deeply committed to their work despite the enormous sacrifices they must sometimes make. In addition to being very committed lovers of trees and natures, the founders of Juthour believed there was a great need for natural space in Palestine, where they could host a collection of trees that would be open to the public. 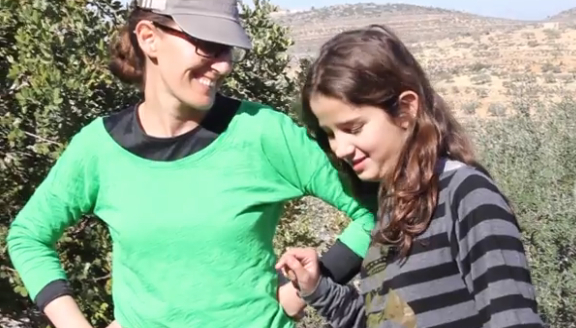 It is a special place where trees of Palestine and other native plant species are safe from development, where families and friends come to learn while having fun. Their efforts are paying off, and they have great support from a willing community. In December 2013, Juthour brought together a team of paid interns, volunteers and friends to do the important work of spreading our message and building a community of people interested in the environment. We work hard on this project, and we all love doing it, especially as a creative and enthusiastic team! It’s a mistake for us to take our wild places for granted. The world is changing quickly and we will need to know how to fend for ourselves in harmony with the land. So anyone who strives to do this deserves our support. In turn we are privileged to learn about ancient olive trees and wild oaks. Your contribution to this campaign could result in a new beehive at Juthour, and we all know that none of us can exist without the bees. All kinds of activities and workshops are offered at Juthour, even camps for children. What better way to help a child feel connected to their land but to expose them to the great outdoors uninterrupted by human development and destruction. Please visit their website for more information, and again, here’s their indiegogo campaign. They’re looking for $35,000 to expand and improve their operations, and open their arms to a broader percentage of a population under siege.